At first glance, a disc combining works by Smetana and Dvořák would appear to be a very Czech affair – after all, the two composers are among the first to be mentioned whenever nationalist currents in 19th century music are discussed. But much of their chamber music had a more personal slant, and this applies to the works presented here by the young Sitkovetsky Trio. Smetana wrote his G minor trio in 1855, ‘in memory of my first child, Bedřiška, who enchanted us with her extraordinary musical talent, and yet was snatched away from us by death, aged 4½ years’ – a shattering event for the parents, and one that seem to reverberate through the entire work. Although the background to Dvořák’s Trio Op. 65 is less well documented, it is known that at the time of its composition (in early 1893), the composer was troubled by various events: the relative failure of his opera Dimitrij’s première in October 1882, the death of his mother that December and the serious health problems afflicting Smetana, his respected older colleague. Possibly this not only coloured his mood, but also his ability to work at speed – in a letter he wrote: ‘For the past eight weeks I have worked on nothing but this new Trio, which occupies my time so completely that I can hardly think of or be aware of anything else.’ These two large-scale works are complemented here by the one-movement Elegy, by Josef Suk, Dvořák’s student and later son-in-law. Composed in 1902 as a memorial tribute for the author Julius Zeyer it was scored for violin, cello, string quartet, harp and harmonium, but soon appeared in an arrangement for piano trio which is far better known than the original. 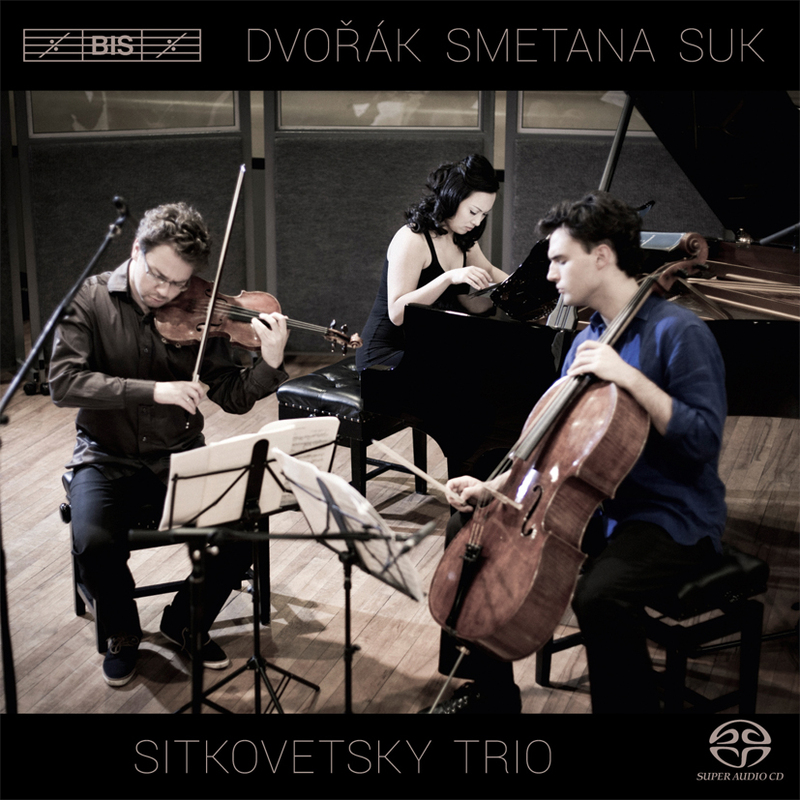 Formed in 2007, the Sitkovetsky Trio performs worldwide and has received numerous awards and critical acclaim, but is here making its début on disc, in a programme perfectly suited to the ensemble’s virtuosic and impassioned music-making.